Disasters are as old as human history but the dramatic increase and the damage caused by them in the recent past have become a cause of national and international concern. ‘Disaster’ is defined as a crisis situation causing wide spread damage which exceeds ability to recover. Thus, by definition, there cannot be a perfect ideal system that prevents damage, because then it would not be a disaster. It has to suffocate our ability to recover. Only then it can be called as ‘disaster’. The disasters often differ in quantity of damage caused or in quality of the type of medical consequences. 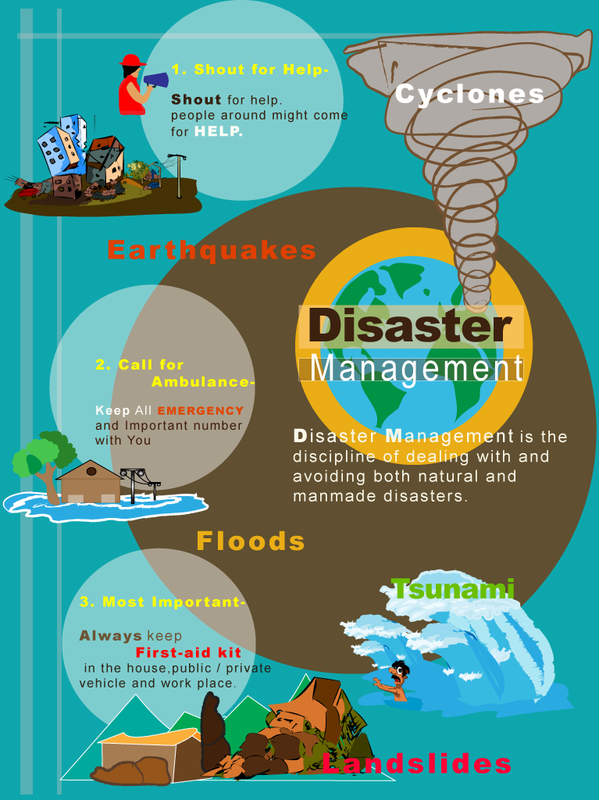 Disaster management is the discipline of dealing with and avoiding both natural and manmade disasters. It is the discipline of dealing with and avoiding risks. This discipline involves preparedness, response and recovery in order to lessen the impact of disasters. Through some safety measures, these disasters could be avoided to some extent. 1.Shout for Help- In case of any emergency, shout for help. There will be people around who might come for help. 2.Call for Ambulance- Make sure that you recall all the emergency contact numbers. You should keep these numbers handy with you. 3.Most Important- Always keep First-aid kit in the house, public/ private vehicle and work place. Your first aid kit should be well equipped with Adhesive tape, bandages, Three medium and three large sterilized dressing, Cotton wool Cotton buds, Disposable (gloves/Tongue depressor), Tweezers, scissors and safety pins. Disaster Phase: This is the phase during which the event takes place. This damage / loss may be that of human life, loss of property, loss of environment or loss of health. Response Phase: This is the period which is immediately followed by the occurrence of the disaster. In this situation, all individuals respond to the disaster, but in their own ways. Recovery Phase: This is the phase when victims actually realize the impact of disaster. It is the phase when all medical help has arrived and people have settled from the adversities of the event. 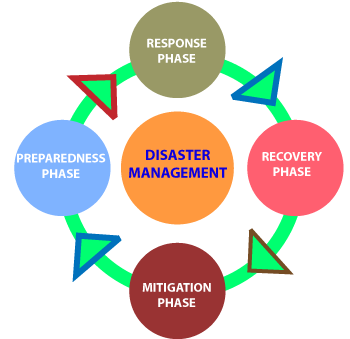 Risk Reduction Phase: During this phase, measures are taken so that in case of next disaster the extent or impact is lessened. This process of making the impact less severe is called "Mitigation". Preparedness Phase: This phase basically involves development of awareness among the population on general aspects of disaster. This includes education on warning signs of disasters, methods of safe and successful evacuation and first aid measures. In case of a crisis situation, you should be equipped with a Battery operated torch and radio, a battery operated radio will help you know what the current situation in your region. Ensure that you are carrying enough food(dry and canned foods). Ideal foods are: Shelf-stable (no refrigeration required), low in salt, and do not require cooking. Pack the hygiene items you need to stay comfortable, but don’t over do it. Toilet paper, cotton bandanna (for face mask or covering head), baby wipes, soap are essentials. First Aid kit: Get a roll of gauze, some gauze pads, medical tape, some painkillers, alcohol wipes, some burn/wound cream and some petroleum jelly or other moisturizer. You’ll have to make your own band aids from gauze and tape, but you’ll be able to cover most other minor injuries. Keep some cash in the kit. If there is an emergency that causes the banks to close or the ATM's aren't available, you may find that you will need it. Keep a list of doctors and family contacts in your kit, along with your personal information. If something happens to you, who should we call? Do you have allergies? Who are you and where do you live? Escape Plan Fire: This tool is designed to help you work out and highlight the escape routes in your home in the event of a fire. Stop Disasters Game: Play stop disasters game and learn how you can prevent disasters. School Safety: Building safe schools will not only ensure safety of children in disasters, but will also promote faster rehabilitation post disaster.